Looking to grow your eCommerce business from the ground up? If you’re reading this post, chances are, you’re either running your eCommerce site on the WordPress platform or you’re planning to. And in that case, you’re already off to a good start. As the most popular content management platform online, there’s no shortage of WordPress eCommerce themes and plugins available to enhance your sales, marketing, and customer service campaigns. Read on to see 5 of the best WordPress plugins for eCommerce sites and how you can use them to build a successful online business that leaves customers hungry for more. Want a powerful tool for WordPress eCommerce, free of charge? Then look no further than WooCommerce. You can’t even talk about eCommerce tools without mentioning it. WooCommerce is the driving force behind 30% of all virtual stores and continues to be the most popular eCommerce platform in the world hands-down, offering more flexibility and customizability than its competitor, Shopify. And that’s not all. WooCommerce also comes with a number of other developer tools and plugins, giving more experienced vendors the freedom to fully customize their eCommerce store to meet their unique needs and preferences. Arguably, the best eCommerce plugin for WordPress in 2019, OptinMonster allows you to boost conversion rates through website optimization, visitor engagement, and lead generation. This happens with the help of interactive elements, like lightboxes and full-screen popups, floating bars, inline forms, and other objects designed to collect visitor data and grow email lists. What’s more, OptinMonster comes with built-in tools that predict visitor behavior, engaging with them before they abandon their carts and bounce from your website. There are countless plugins out there to get your WordPress eCommerce site up and running in minutes, but only a handful address the needs of digital sales. If your business sells virtual items like video clips, ebooks, songs, and other intangible items, you’ll need a platform designed especially for digital transactions. This can be challenging because many of the top eCommerce tools and platforms focus almost exclusively on physical products. That’s where Easy Digital Downloads comes in. Also, don’t be surprised by Easy Digital Downloads’ lightweight design. It’s fully capable of being customized to meet the unique needs of your business thanks to a growing list of supported extensions that offer a wide range of functions. From alternative payment processing solutions to specialized download management tools, Easy Digital Downloads’ add-ons give you complete control over who can access your virtual content and how. Want to make data-driven decisions that enhance your eCommerce site, but find Google Analytics frustrating and overwhelming? If so, MonsterInsights is the perfect plugin for you. MonsterInsights gives you the power of Google Analytics in an intuitive, easy-to-use platform designed to give you deeper insights into how visitors are interacting with your website. It even offers enhanced eCommerce tracking features for users operating on WooCommerce and Easy Digital Downloads platforms, enabling you to come up with actionable solutions to boost conversion rates and grow your customer base. According to McKinsey, brands that use analytics effectively gain a 126% increase in profit over their competitors. MonsterInsights brings that power of analytics to your WordPress website. With the simple click of a button, you’re presented with real-time data on the performance of your eCommerce site, as well as deeper insight into customer preferences and the success of your sales and marketing initiatives, all of which is important for building a platform that customers want. Good SEO practice goes a long way in increasing traffic and potential earnings on your eCommerce site. But ensuring your website content is SEO-driven and aligned with Google’s constantly changing algorithms is another story completely. A lot of time and effort goes into optimizing websites for SEO performance, which is why many companies hire a professional to do their SEO work for them. But what if there was a way you could keep your eCommerce site SEO-friendly without adding another person to your company payroll? With Yoast SEO, you can. As a result, you’re able to rank higher on Google and Bing searches, as well as tweaking your social media strategy on popular platforms like Facebook and Twitter. The end result? An SEO campaign that helps you increase leads and enhance brand awareness. See for yourself how effective Yoast SEO is when used alongside OptinMonster! 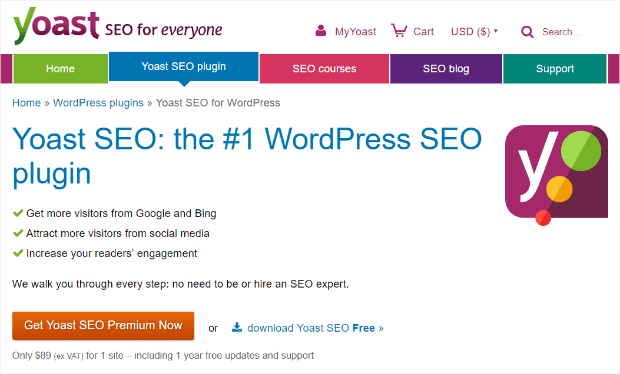 Yoast SEO comes with two WordPress eCommerce pricing tiers: premium and free. With the free version, you benefit from readability assessments and basic SEO services like flagging duplicate content and keyword optimization (limited to only one keyword), which is pretty helpful if you’re looking to tweak your website performance. If you’re looking for something a tad more convenient and comprehensive, try the premium version for $89 per year. Yoast SEO Premium offers the same exciting features as the free version, as well as unlimited keyword optimization, internal link suggestions, keyword insights, and an easy-to-use redirect management tool that helps prevent visitors from landing on “404 Not Found” pages. You don’t need to reinvent the wheel just to build a successful WordPress eCommerce site. All you need to do is tap into your customers’ needs and expectations while creating a platform that’s engaging and easy to navigate. With the help of these 5 plugins, building a successful eCommerce business is easier than you think, especially thanks to the innovative lead-generation tools you get from using OptinMonster. Brandon thanks for providing information regarding word-press plugins. This will help me a lot as I am also working on a eCommerce website.